My lovely orange nails have had to come off. They were starting to get chipped and although the chipped look can sometimes look quite cool, I was starting to pick which is not cool. I was recently sent a sample of Eden Natural Nail Polish Remover so was a perfect opportunity to try it. 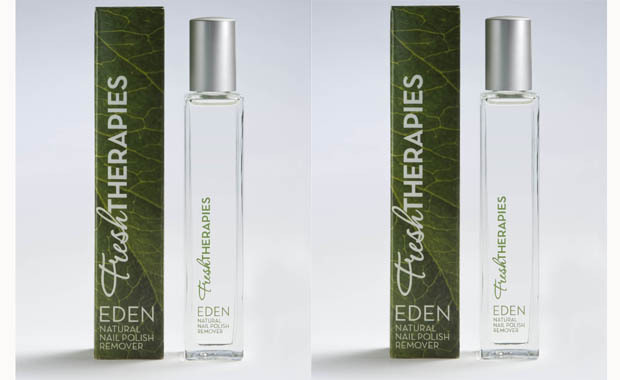 A new product from Fresh Therapies, the remover is a water like substance with a very light soft citrus smell. Unlike many removers on the market it contains no acetone or other chemical nasties which can dry and damage your nails. Instead it is made from naturally derived ingredients that can help to moisturise instead. It certainly did its job well and removed the colour with ease, there was no oily residue and my nails didn’t feel stripped. They felt nice, clean and comfortable, and you could go straight over with a new colour if you wanted to. In my kit I currently have the Soy Nail Polish Remover from Priti which is great. The smell and texture is lovely although it is oily – I quite like that as you can feel the good it is doing, however it can be a little messy if you need to re-paint straight away. I had a model a few weeks ago who I don’t think had taken her varnish off for weeks, instead she just kept painting over and over. It is fair to say she had a few layers of varnish on! The Priti got it off eventually but after a lot of time and effort from me, I feel that maybe the Eden might be a little more hard working. Perhaps better for those who tend to layer it as well! Have a little read about it for yourself…. Next Post Rose-Marie Swift comes to London!